It's apple picking season! If you have a trip to the orchard planned, these healthy recipes will put your haul to good use. It's fall, which means many of us have a trip to an apple orchard on our bucket list. According to the US Apple Association, there are over 100 apple varieties grown in the United States. Take a trip down the apple aisle at your supermarket or visit an orchard and that number becomes much more believable. As a matter of fact, the United States has 7,500 apple producers, who grow 240 million bushels of apples each year, totaling a whopping $4 billion in revenue. Regardless of when you’re shopping, there are a few tricks for picking the best apple in the bunch. First, it should be firm to the touch and free of bruising or brown spots. A few scuffs or specks on the apple are quite normal and don’t indicate a bad apple. It’s difficult to recognize a “good” apple by color, since each varietal is different. But the apples with the most vibrant color have absorbed the most sunlight and are likely to have the best flavor. This is how your brain and body react when you're at the orchard. Once you get your bushel of apples home from the orchard (or market), store them in their own drawer in the fridge. Apples actually give off ethylene gas, which can make nearby produce go bad. If you’ve got a major haul that won’t fit in the fridge, keep them in a dark cool place, like a garage or cellar. Thicker skin varieties, like McIntosh, Fuji and Granny Smith, will keep the longest. With just 100 calories and 20 percent of your daily fiber, it really is worth adding an apple a day to your diet. Rather than Googling “best apples for pie” while standing in the produce section, take the guesswork out of apple picking and add these versatile options to your list. The gorgeously green Granny Smith apple is sure to make you pucker. It’s tart and crisp flavor pairs nicely with savory dishes and nut and cheese plates. “I like to use Granny Smith apples in salads, sautéed or roasted sides and entrees, and baked goods,” says Chef and Registered Dietitian, Abbie Gellman, MS, RD. She adds that the tartness mellows slightly when you cook Granny Smiths, and these apples hold their shape well in baked goods. 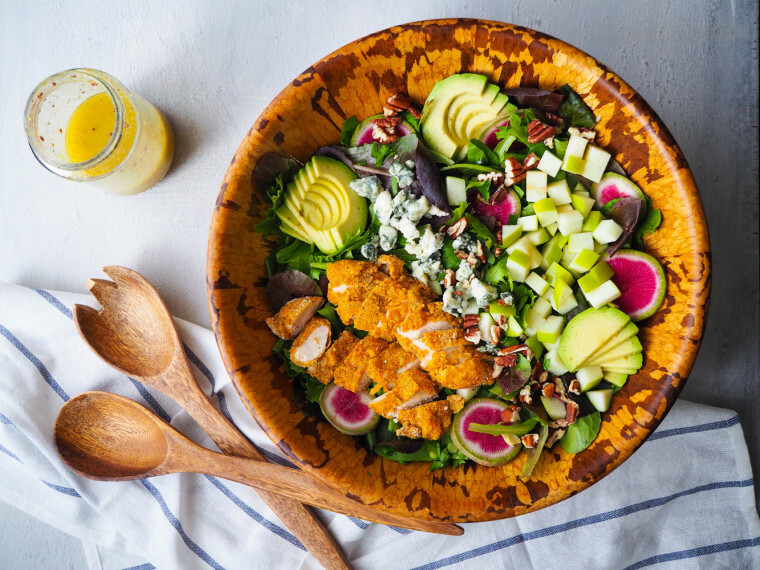 Recipe box: Try the most traditional Granny Smith combo in this Harvest Salad with Crispy Cornmeal Chicken, Apples and Gorgonzola. The apples, nut and cheese combo is heaven on a plate! The darling of the apple world, this apple newcomer is juicy, crisp, sweet and mild tasting. Gellman refers to it as an “eating apple” because it’s delicious on its own or paired with nut butter. “I like to use Honeycrisp apples for baked goods that are more dessert-specific, such as apple cake or apple pie, as well as in salads or roasted sides,” she adds. As a fun aside, the honeycrisp apple is Minnesota’s official state fruit. Recipe box: Honeycrisp apples work well in virtually every recipe, but they add a nice crunchy bite to a grilled apple and cheddar sandwich. Or wrap honeycrisp slices in prosciutto and add to a charcuterie board. The McIntosh embodies balance with its mildly sweet and tangy taste and juicy and creamy texture. Because it grows well in cold temperatures, this apple is native to New York and has been around since the 1800’s. Recipe box: With it’s slightly sweet and acidic nature, the McIntosh apple lends itself well to hot drinks. Drop some peeled McInotsh into your Instant Pot with aromatic spices and you’ll have a Warm Apple Cider in no time. Although this is the most popular apple in the US, it’s probably the least versatile. The flavor is very mild, and its soft flesh doesn’t hold up well to heat. Some might even call it mealy. Yet, it’s ruby red color and conical shape make it ideal for decorations or centerpieces. Don’t try to cook this variety, as it may break down under pressure. Recipe Box: Red Delicious are best eaten raw, so use them as the base for this Spirazlied Apple Peanut Butter Salad or treat your tastebuds to an umami bomb in this Apple Brie and Mushroom Panini. You can spot a gala apple by it’s red and yellow hue. It’s one of the sweetest in the bunch, and it’s crisp texture is great for eating raw, juicing or throwing into salads. Recipe box: For the ultimate fall treat, combine crisp gala apples with roasted delicata squash in this homey salad. Native to Japan, the Fuji apple is like candy! “Their higher sugar content means you can go a bit lighter on added sugars in the recipes,” says Harrington. This multi-purpose apple is great as the base for pies, and it doesn’t brown quickly and adds a nice crunch to salads. Recipe Box: Pair this sweet apple with cabbage to make a crunchy apple slaw. It’s the perfect accompaniment to chickpea, tuna or chicken salad. The less commonly used apple is complex, with a sweet yet tart taste and hints of cinnamon and nutmeg. The Braeburn can stand on its own as a snacking apple, but it also holds up well to the heat of the oven. Recipe box: If you’ve never tried a Braeburn before, you’ll be excited to wake up to the smell and taste of fall with this Jumbo Skillet Apple Pancake. “You can count on Golden Delicious apples for having just-right sweetness and crispness; they get extra-soft when baked,” says Jackie Newgent, RDN, culinary nutritionist, author of "The All-Natural Diabetes Cookbook." She recommends using them when you want to use less sugar in a recipe without any tartness, like in a leafy salad or in homemade applesauce. True to their name, Golden Delicious apples have a beautiful yellow hue. Recipe box: Technically you can use your favorite type of apple for this Applesauce recipe, but why not give the lesser used Golden Delicious a try?